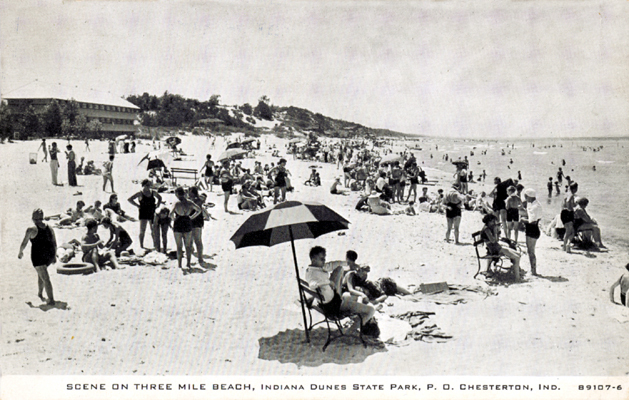 TITLE: Scene of Three Mile Beach, Indiana Dunes State Park, P. O. Chesterton, Ind. 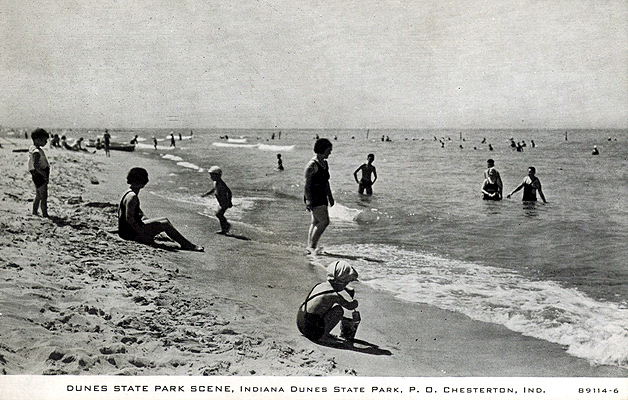 TITLE: Dunes State Park scene, Indiana Dunes State Park, P. O. Chesterton, Ind. 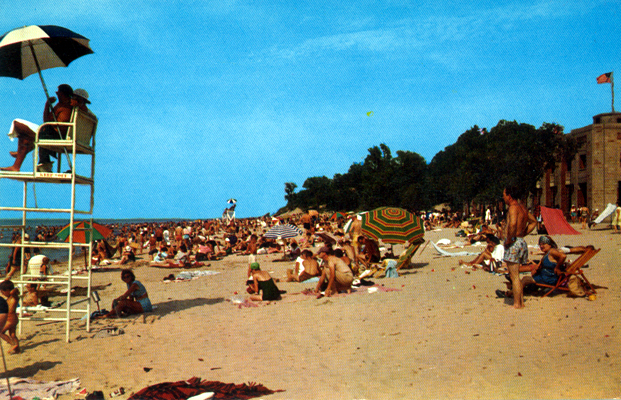 TITLE: Indiana Dunes State Park, Chesterton, Indiana. 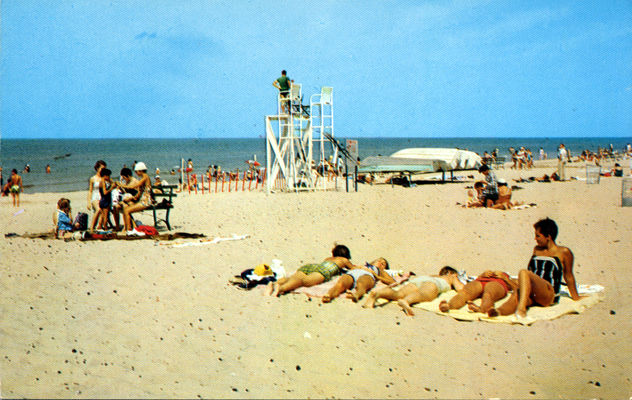 After a cooling dip in Lake Michigan, pretty sun worshippers enjoy lolling on the warm sands, bringing many opportunities for girl watching. 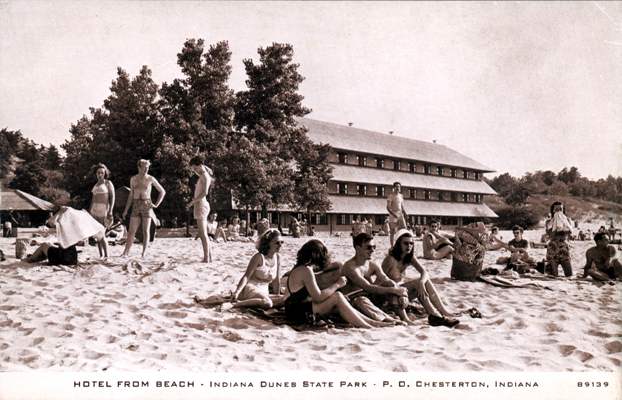 TITLE: There's plenty of room for sun-bathing and swimming on Waverly Beach at Indiana Dunes State Park, Chesterton, Indiana. 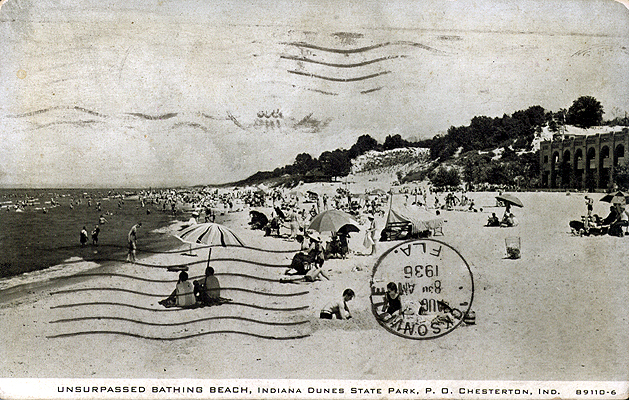 TITLE: Unsurpassed bathing beach, Indiana Dunes State Park, P. O. Chesterton, Ind. 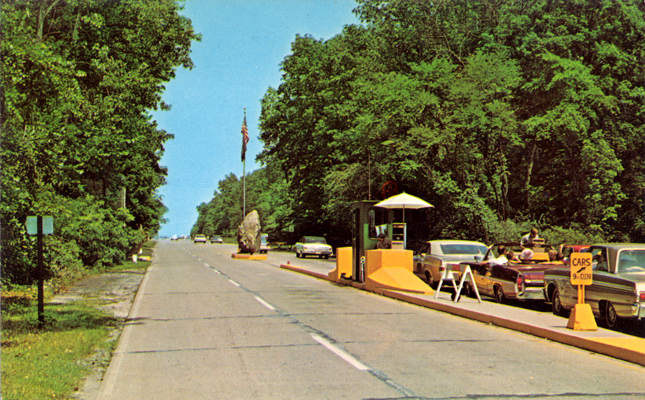 TITLE: Indiana Dunes State Park, Chesterton, Indiana. 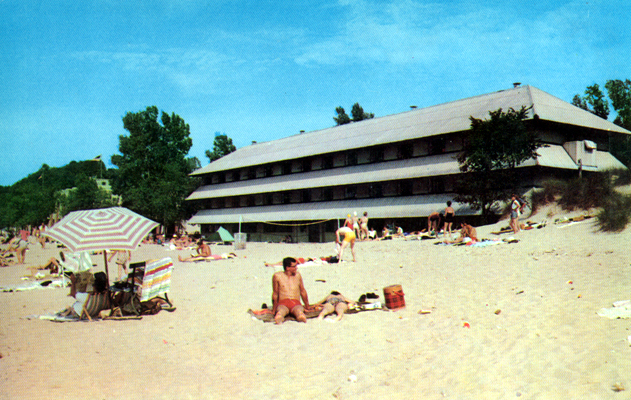 Waverly Beach, a favorite spot on Lake Michigan for swimming, sunbathing, and picnics. 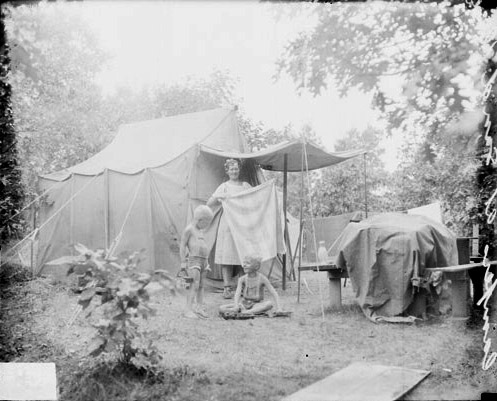 With plenty of parking space nearby. 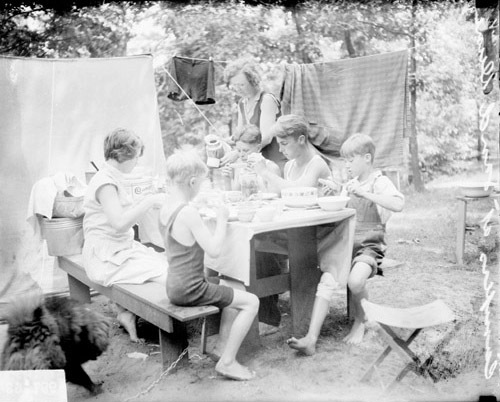 TITLE: Indiana Dunes State Park, Chesterton, Indiana. 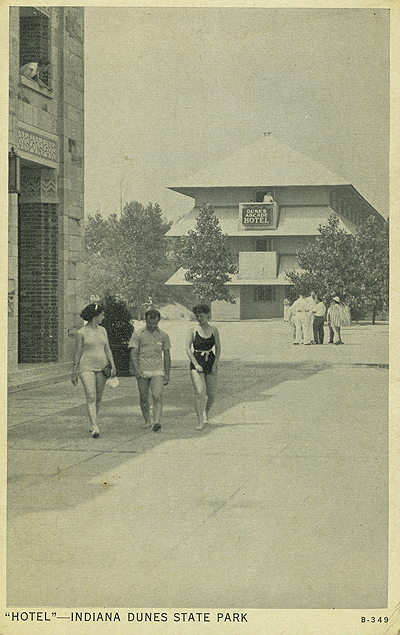 Dunes Arcade Hotel, overlooking beautiful Lake Michigan, with its 50 rooms and large airy dining room operated on the American Plan, was designed by architect John Lloyd Wright, A.I.A. 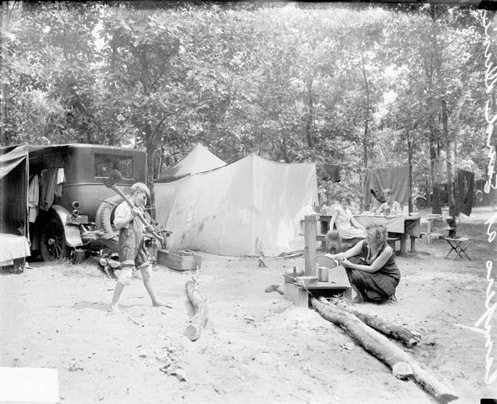 TITLE: Beach and Pavillian [sic], Ind. 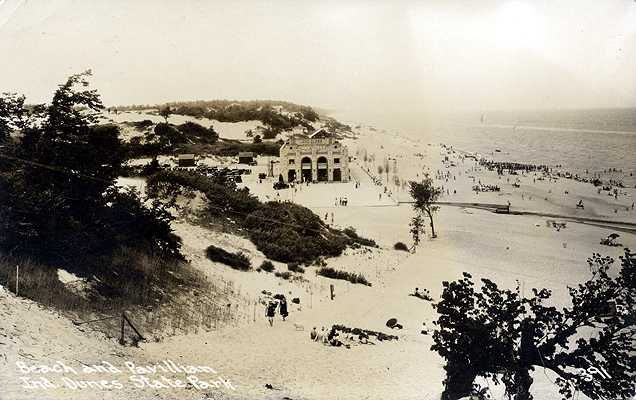 Dunes State Park. 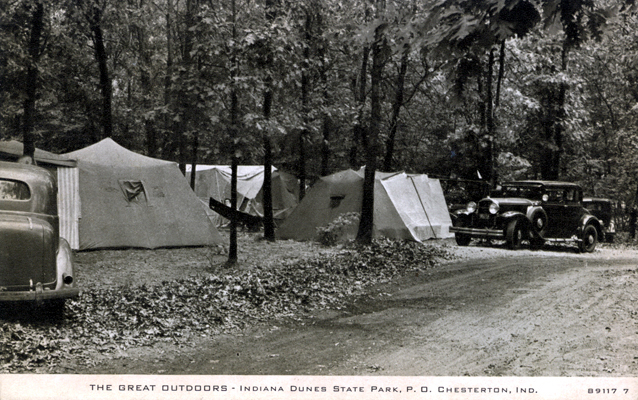 TITLE: The great outdoors -- Indiana Dunes State Park, P. O. Chesterton, Ind. 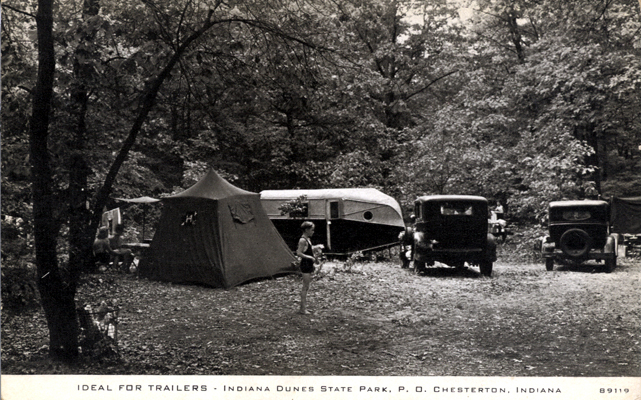 TITLE: Ideal for trailers -- Indiana Dunes State Park, P. O. Chesterton, Ind. 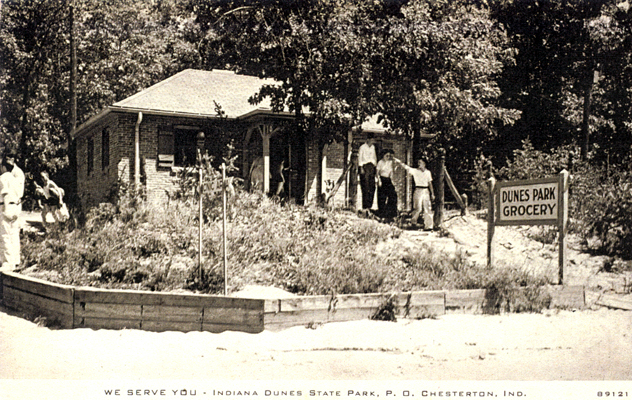 TITLE: We serve you -- Indiana Dunes State Park, P. O. Chesterton, Ind. 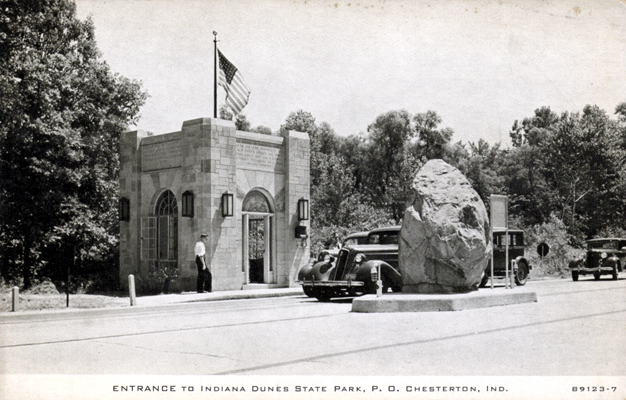 TITLE: Entrance to Indiana Dunes State Park, P. O. Chesterton, Ind. 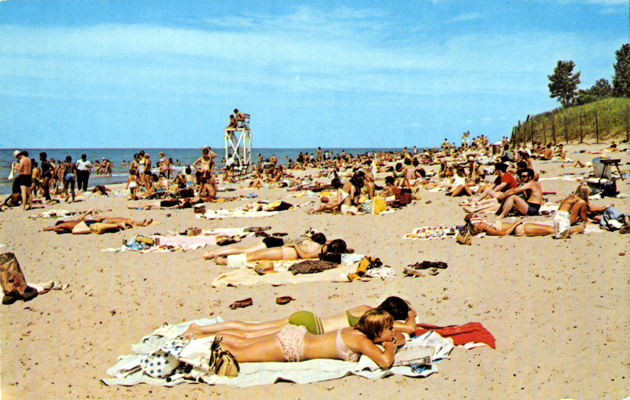 TITLE: Indiana Dunes State Park, Chesterton, Indiana. 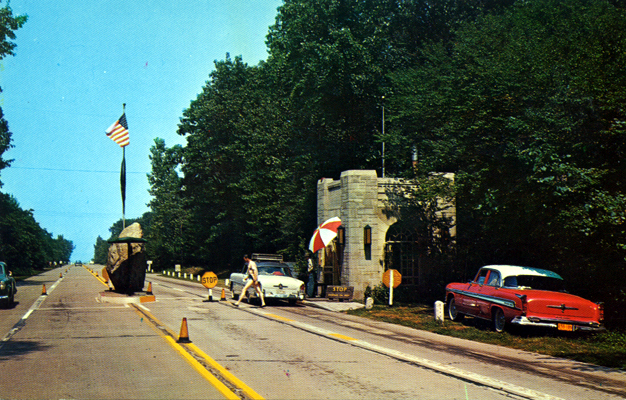 Gatehouse and park entrance. 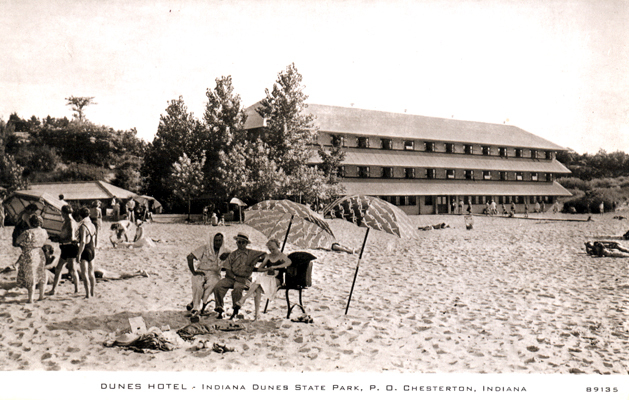 TITLE: Indiana Dunes State Park, Chesterton, Indiana. 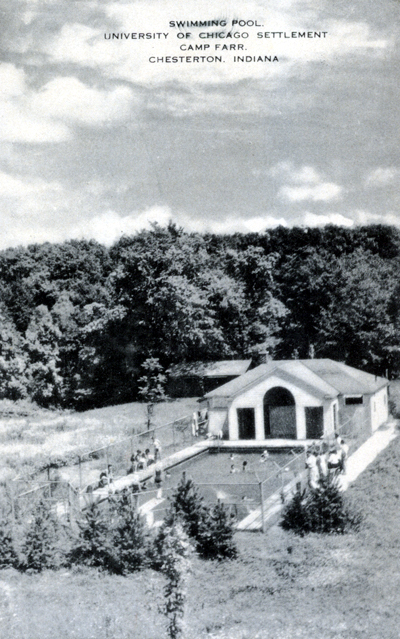 Park entrance and gatehouse. 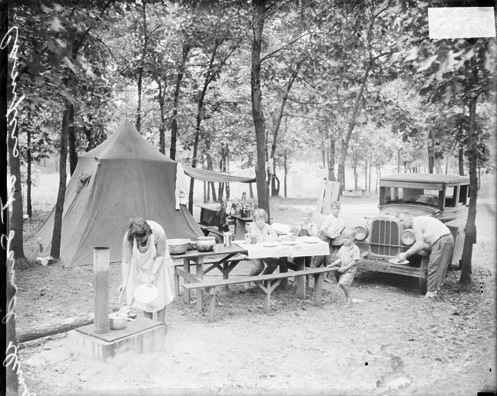 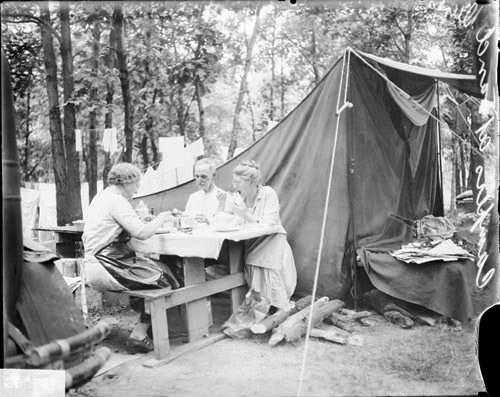 TITLE: Group camp, Indiana Dunes State Park, P. O. Chesterton, Ind. 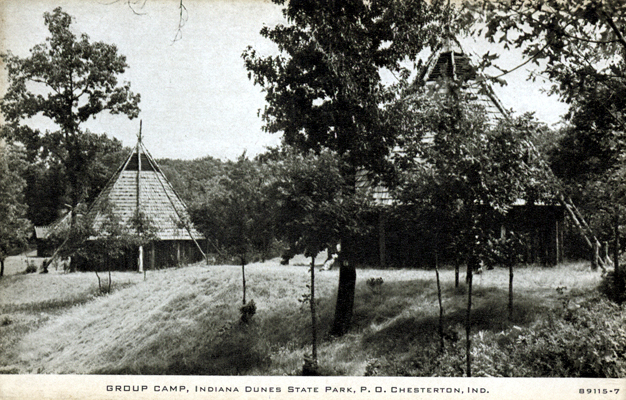 TITLE: Group camp, showing totem pole -- Indiana Dunes State Park, P. O. Chesterton, Ind. 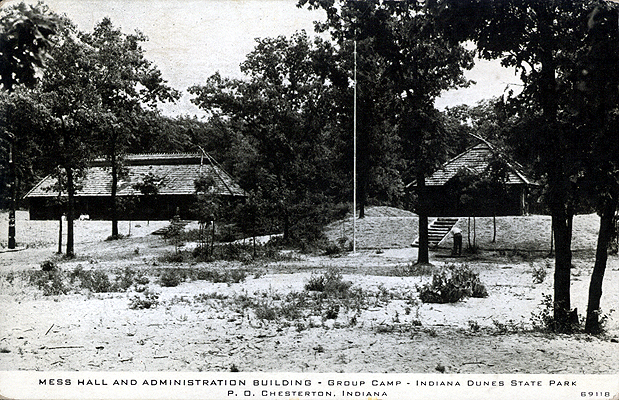 TITLE: Mess hall and administration building -- group camp -- Indiana Dunes State Park, P. O. Chesterton, Ind. 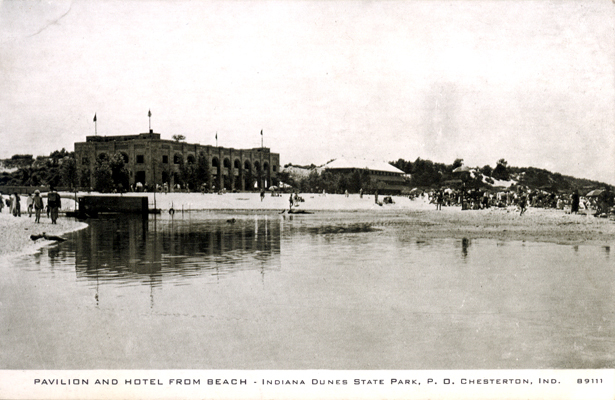 TITLE: Pavilion and hotel from beach -- Indiana Dunes State Park, P. O. Chesterton, Ind. 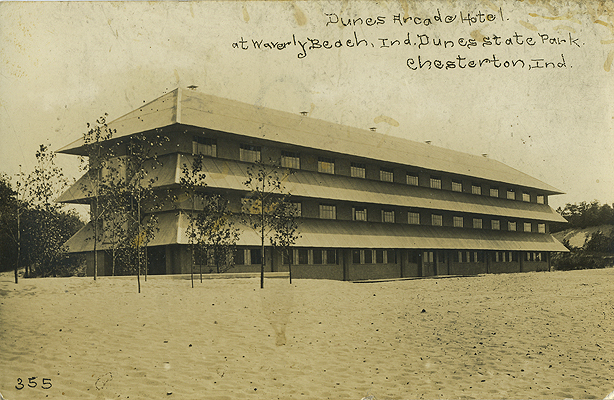 TITLE: Dunes Arcade Hotel at Waverly Beach, Ind. 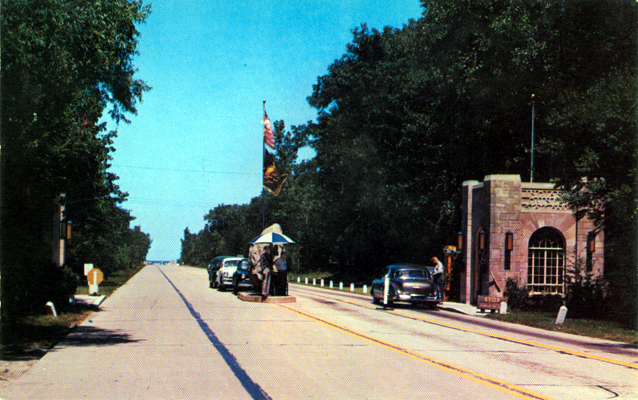 Dunes State Park. 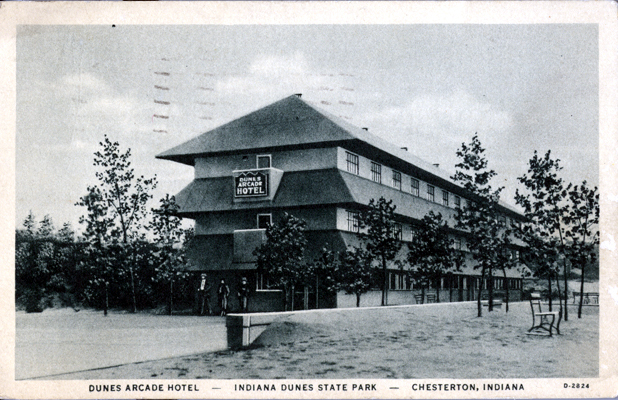 Chesterton, Ind.